Scotland’s largest independent brewer BrewDog has launched its first craft beer shop – dubbed “BottleDog” – in London. The BottleDog store at 69 Gray’s Inn Road, near the Chancery Lane Tube Station, is the first in a series of new craft beer shops that the brewer and pub operator plans to open in the United Kingdom and Scotland in 2014. BottleDog store stocks more than 250 craft beers, as well as home-brewing equipment and the ingredients you need to make your own beer, such as malts and hops. It has four beers on tap, plus customers can fill their own flagons of craft beer, to take away and drink at home. The shop has seating capacity for up to 25 people and will host “beer school” and tasting sessions in the near future, as well as opportunities to meet guest brewers. 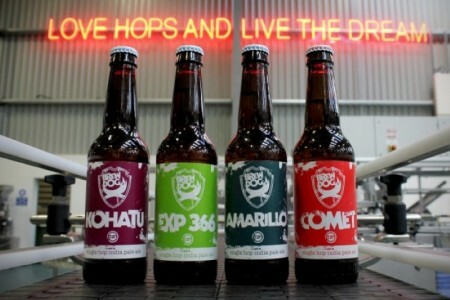 BrewDog co-founder James Watt commented: “BottleDog will have the most extensive craft beer selection you can get your hands on in London, with epic beers from all over the world. We’ve worked hard to create an atmosphere that fosters knowledge sharing and champions the next generation of craft brewers. BrewDog is looking at opening more BottleDog shops in 2014 and has already secured sites in Cardiff, Liverpool and Dundee for new BrewDog bars.